Last year in Todi our happy students! In Todi, a gorgeous Umbrian hill town, students enjoy living the "Italia" lifestyle: food, people, art, nature. You can live with an Italian family or in an independent apartment or hotel. Italian language lessons will be held during the morning and cultural activities in the afternoon. SUMMERTIME in Todi: Discover the real Italy in Umbria! We’ll meet at Rome International Airport Fiumicino FCO at 11:00 am for private transportation to Todi. Benvenuti a Todi! Get settled and meet your host family! (Evening) Dinner with your host family. (3.30 pm) Guided historic walking tour of the town and Aperitiviamo (let’s have a chat and get a drink together!) A chance to have a chat in Italian outside the classroom in a relaxed situation seated at the bar drinking a Prosecco or a delicious fruit juice cocktails together with your teacher! (2:30) SPELLO - Half-day excursion to Spello: a visit to the Church of Santa Maria Maggiore with its famous Cappella Baglioni that has a ceramic Deruta's floor and Pinturicchio's frescoes (considered his best production and his self-portrait), then to the Church of S. Andrea built in 1258 and the Church of S. Lorenzo with its impressive facade, a twelfth century loggia, rosettes and decorative elements. We will visit togethert also Villa Costanzi, better known as Villa Fidelia : created on the ruins of a Roman sanctuary , has a structure with terraces and was wanted by the Urbani family in the sixteenth century . It hosts cultural events and concerts and inside has a beautiful park with old trees and a palace with exhibitions of contemporary artists. Dinner at the end of the Cooking Class. (4:00) GAITE MARKET IN BEVAGNA, half day excursion plus typical dinner: the most famous medieval festival in Italy. 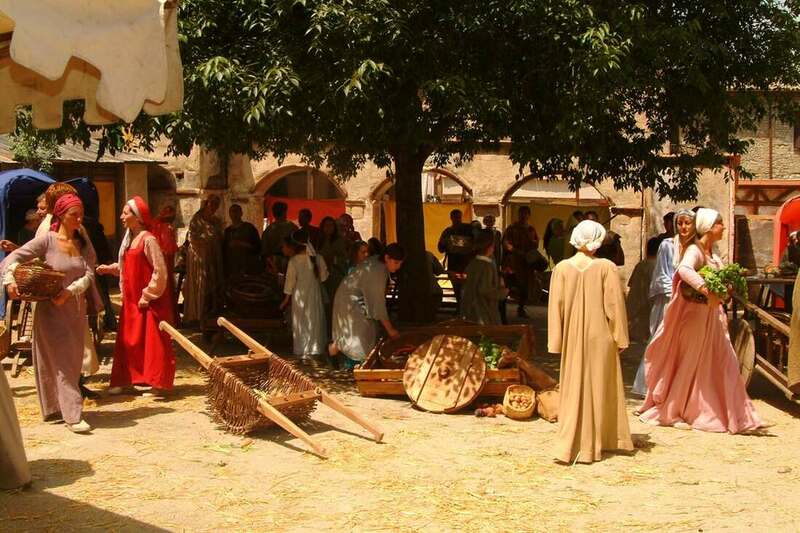 The event recreates the daily life of Bevagna between the 13th and the 14th century. During the festival streets and squares get populated by people dressed in carefully reproduced medieval costumes, many old workshops take life and open their doors to show ancient working techniques to thousands of spectators and tourists coming every year to experience this special atmosphere. Final Day! See you in Todi in 2020! cultural activities: transportation, entry tickets, cooking class with wine. Each private transfer from Todi to Rome (and Rome to Todi) costs additional 41,00 euro per person (or E.59 for less then 10 people). Price does not includes the dinner at Gaite Market in Bevagna and tickets to museums and churches. Todi, FIAT 500, old model.